We are proud to be a part of Kiva, a microlending organization that connects regular people like us who want to help entrepreneurs in poverty-stricken areas to be successful in their small businesses. With Kiva, lenders can choose where their money goes by selecting an entrepreneur based on preferences like geographic region, business sector, the terms of the loan, and even gender. As of November of 2009, Kiva had facilitated over $100 million in loans. (They also now allow funding of loans to U.S. entrepreneurs). Along with Brigette’s volunteering on the Kiva Editing Team to edit the loan descriptions that lenders see, the Inn on Mill Creek has been part of 19 microloans to small business owners, all of whom live in developing countries, and we continue in 2010, with our first Kiva microloan of the year. While Brigette was editing loans this week, she came across one for Haidar (pictured above), a 43-year-old man who lives in Lebanon. He has worked as a painter for 20 years, specializing in home projects. He put in a loan request to buy new painting tools and supplies. 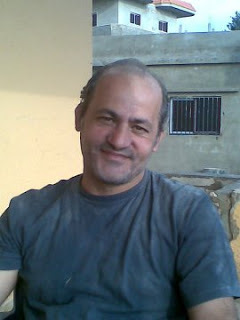 Haidar’s loan is funded through Kiva field partner Ameen, a micro-credit program in Lebanon established in 1999 through funds from USAID under the patronage of CHF International, a non-profit organization working in more than 35 countries. Haidar’s wish is to be able to meet the demands of his clients and to provide for his family, which includes three children. We hope everything works out for Haidar and that he is able to run his business successfully for another 20 years if that’s his desire. 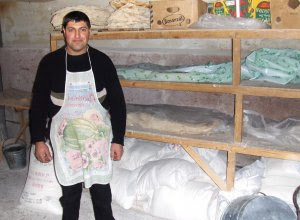 Babken Hovhannisyan had used his loan to buy wholesale purchase of flour and mini lorry. He used part of flour in his business; another part he had sold and has taken a good profit. Now with his new car Babken delivers his production to Sevan area shops. His business now is developing well. Babken is very happy and send his thanks to Kiva lenders. We love hearing that small business entrepreneurs are succeeding in making themselves financially stronger and their communities economically viable. At just 22 years old, Babken is not only working toward making the bakery a successful long-term venture, but he is also using some of the profits to pay his way through teacher training school. And on top of that, we learn that he was able to buy a car to deliver his baked goods. Very inspiring. Way to go, Babken!